This delicate sculpture, which stands just about 10 inches tall (ca. 25 cm), was once part of a larger ensemble of figures gathered around the foot of the cross at the Crucifixion. It comes from Guatemala, which was famed for its sculptural works throughout Spanish America. To capture the particular quality of bare skin, sculptors would sometimes incorporate faces and hands made of other materials into their wooden sculptures. The face and hands of this work are made of ivory, which may have been imported from the Philippines, evidence of the trade networks that tied Spanish America to Asia. In standard depictions of Christ’s crucifixion, the prostitute Mary Magdalene kneels, with her arms placed around the cross. The diagonal slant of this figure suggests she was once placed similarly. The artist has used a gold leaf overlaid with paint to create the foliate designs of Mary Magdalene’s clothing. The designs are slightly oversize, perhaps a sign that the painter was proficient with life-size sculpture produced in the same workshop. On most wooden sculpture, an elaborate painting process called encarnación produced a finish that mimicked human skin. 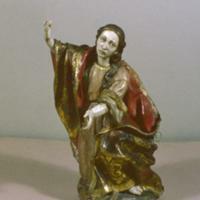 In this small work, the artist used ivory, a precious imported material for the face and hands. Other sculptures incorporate alabaster, which was available in the New World. The earliest sculptures in Guatemala seem to have been produced in workshops founded by Spanish émigrés in the 16th century. Guatemalan works were soon known throughout Spanish America for their quality, and were often exported to other areas of New Spain. It is not known who made this piece. Of the thousands employed in artistic production during the colonial period, only the names of a few masters survive. The harmony between head made from imported ivory and the rest of the sculpture suggests they were finished by the same carver—whether the ivory came from Asia in unworked pieces or roughed-out forms is not known. In some works, ivory heads and hands were carved in Asia, transshipped across the Pacific, and then incorporated into works by New World artisans. To create Mary Magdalene’s garments, artisans coated the carved wooden sculpture with gold leaf, then painted it. Then they scratched their designs into the paint, allowing the gold to show through, a technique called estofado. The combination of black and red garments with foliate gold designs is found in many Guatemalan pieces from the 18th century, and suggests close exchanges between the artisans in the many sculpture workshops in, and around the city of Antigua. 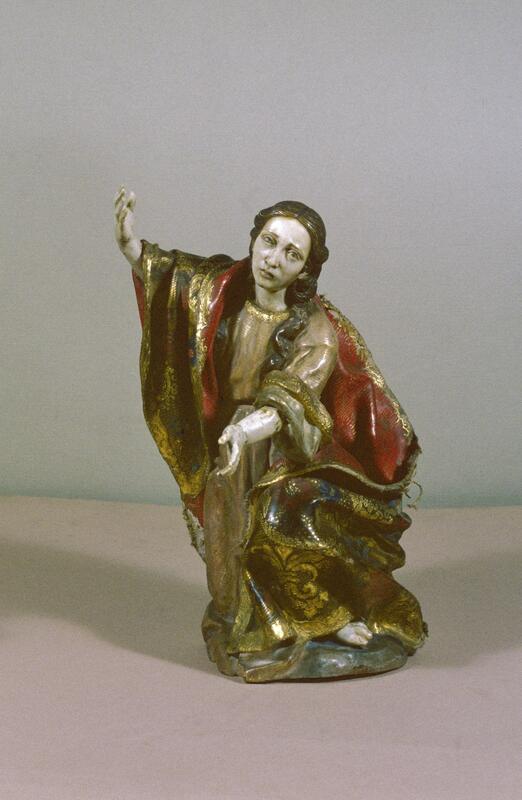 This Magdalene is small scale, about the width of a human hand. Originally, she was probably formed part of an ensemble of figures that once graced a domestic altar in an elite home. Today she is in the collection of the Museo Popol Vuh in Guatemala City. The creation of such domestic sculpture, meant for private devotion, was a mainstay of the artisan economy in Antigua, Guatemala. Such pieces echoed larger works found in churches and made in the same workshops. The visual models for statues, be they large or small, were often European prints which were popular across Spanish America and helped establish a standard vocabulary for sculptures and sculptural ensembles. The incorporation of Asian ivory shows how artists in Spanish America made use of ideas and materials from both east and west. Álvarez Arévalo, Miguel. A. 2002. “Doloroso. “ in El país del Quetzal: Guatemala maya e hispana. Madrid: Sociedad Estatal para la Acción Cultural Exterior. Gallo Armosino, Antonio. 1979. Escultura colonial en Guatemala: evolución estilística de los siglos XVI, XVII, XVIII. Guatemala: Dirección General de Cultura y Bellas Artes. García Sáiz, Concepción. 2002. “Cristo de Esquipulas.” In El país del Quetzal: Guatemala maya e hispana. Madrid: Sociedad Estatal para la Acción Cultural Exterior.